In recent years some of the very best action figure likenesses have been of martial arts icon Bruce Lee, with particular praise inevitably going to Japanese toy makers Enterbay who have seriously raised the stakes, turning their action figures into real works of art. Following in the footsteps of their Enter the Dragon, Fist of Fury, The Way of the Dragon and Game of Death figures, they've now issued another startlingly good Bruce Lee 1/6 scale action figure, this time in the role of Kato which he played during the late 1960s in the cult TV series The Green Hornet alongside Van Williams. The figure comes with two different hair styles to give Kato two very different looks, a series-accurate costume, a removeable mask and old-style chauffeur's hat, plus Kato's kit of throwing darts and interchangeable hands. The figure stands 12 inches tall and includes an impressive 15 points of articulation. As with their previous Bruce Lee action figures which are now officially sold out, this will be a limited edition with a run of only 5,000 pieces worldwide, issued with a Certificate of Authenticity and packaged in an exclusive Green Hornet Premium box. 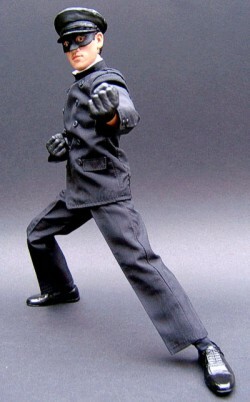 Green Hornet Kato Bruce Lee 1/6 Scale Figure - Order TODAY!